In 10-inch skillet, melt butter over medium-low heat. Cook onions and sugar in butter 30 to 35 minutes, stirring frequently, until onions are deep golden brown and caramelized. Stir in thyme and stew meat; place in slow cooker. In medium bowl, mix broth and gravy mix; pour over meat mixture in slow cooker. Top with carrots and parsnips. Cover; cook on Low heat setting 8 to 9 hours or until beef and vegetables are tender. Stir in peas. Cover; cook 10 to 15 minutes longer or until hot. Substitute mushroom beef gravy mix or brown beef gravy mix for the onion gravy mix, if desired. 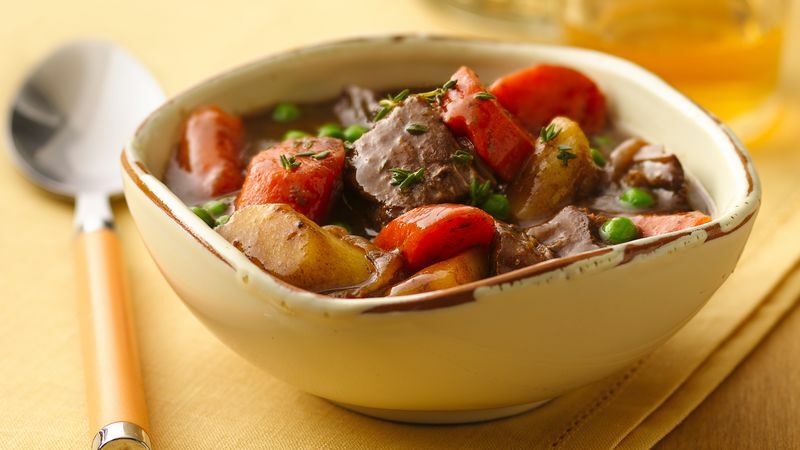 Serve this saucy beef stew over mashed potatoes with plenty of crusty bread for mopping up the extra sauce.